Just time to rush out a hastily-cobbled together edition of the Bioscope Newsreel for you, picking up on a few of the things happening in the silent world that have caught our eye over the past couple of weeks. The Guardian has published a profile of Kevin Brownlow, asking why a man who has won an Oscar for a lifetime dedicated to preserving the art of silent film isn’t better known in his own country. Read more. On July 20 John Bengston, author of Silent Echoes and other books on the locations behind classic silent comedies, gave a presentation before the Academy of Motion Pictures Arts & Sciences on the locations used by Buster Keaton for The General. The Academy has published his compelling and superbly researched PowerPoint slides, with Bengston’s commentary, on its site. Read more. On that truly engrossing and mysterious site The Cine-Tourist, Roland-François Lack has posed an intriguing question. He has examined closely the film credited as Bébé victime d’une erreur judiciaire, an extract from which appears on the recent Gaumont boxed DVD set Le Cinéma premier, 1897-1913. 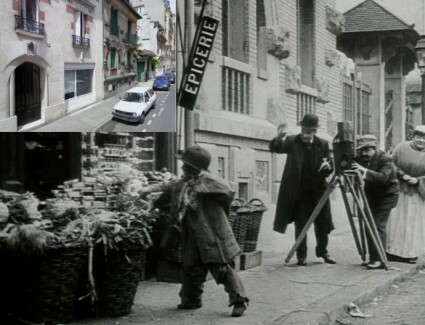 But this supposed Gaumont film was sot outside the Pathé studios, as his meticulous visual evidence makes clear. What is going on? Can you solve the mystery? You may certainly enjoy the detective work. Read more. Germany’s silent film festival takes place 11-21 August and the programme has been published (in German). Among the highlights are Frank Borzage’s The Circle (US 1924), Mosjoukine in Les ombres qui passent (France 1924), the astonishing unreleased (except in Japan) experimental German film Von Morgens bis Mitternachts (Germany 1920), Shingun (1930) – Japan’s answer to Wings, and Bolivia’s sole surviving silent feature film Wara Wara (1930). Read more. Yes, we can bring in the News International scandal which has so engrossed the British media, because there is a tangential silent film angle. When someone rejoicing in the name of Johnnie Marbles interrupted the Culture Media ans Sport select committee’s investigation into the phone hacking scandal by placing a foam pie in Rupert Murdoch’s face, he was acting in a tradition that goes back to the custard pies beloved of silent cinema and beyond. The BBC News site investigates the history. Read more.